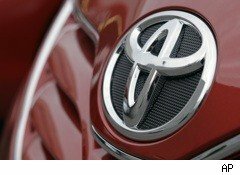 When Toyota Motor (TM) reports quarterly earnings Friday it will give investors the latest snapshot of how big a toll massive safety recalls and tepid auto sales are taking on the company's bottom line. The Japanese automaker, the world's largest, is expected to report a profit of 157.5 billion yen ($2 billion) in its fiscal second quarter, according to a poll of analysts by Thomson Reuters. A year ago, Toyota reported it earned 21.8 billion yen during the same July to September period, which included boosted sales from the U.S. government's "cash for clunkers" program. Shortly after its recall woes began in January, Toyota sought to prop up sales by offering generous incentives to consumers, including low-cost financing, cheap leases and free maintenance. The enticements have helped the company sell more cars than last year, one of the worst in modern memory, but consumers remain wary. Rival Ford Motor (F) has consistently outsold Toyota since April, allowing the Dearborn, Mich.-based automaker to reclaim the No. 2 spot in the U.S.
On Wednesday, Toyota said that compared to a year ago it sold 4.4% fewer vehicles in October, the only major automaker to report a sales slide for the month. As was the case with other car companies, Toyota moved greater numbers of trucks and large sports-utility vehicles off dealers' lots, but sold far fewer passenger cars -- its bread and butter in the U.S. market. Demand for popular Camry, Corolla, Prius and other models have been dogged by Toyota's quality woes. The Camry, which perennially tops sales charts in the U.S., was included in recalls earlier this year of about 8 million cars to prevent unintended acceleration, caused by either sticky gas pedals or bulky rubber floor mats that can entrap accelerators. Those recalls marked only the beginning. Since then, there have been many more campaigns to repair brakes, stop fluid leaks, fix stalling engines and others. Toyota also faces myriad lawsuits related to the recalls, further damaging its quality image. The company's problems, however, aren't limited to those of its own making. The increasing value of the yen is also pinching profits, making it more expensive for Toyota (and other Japanese automakers) to sell goods overseas. Last month President Akio Toyoda said the rising yen was "a big problem" that could threaten the very foundation of Japan's manufacturing culture. Toyota expects to sell some 7.38 million vehicles worldwide in its fiscal year, which ends in March. That's up from 7.24 million last year, when industry sales were driven lower in the aftermath of the financial crisis. Prior to its numerous recalls, however, Toyota was on track to sell 10 million vehicles. Toyota's quality woes have tarnished its once spotless image for safety and durability, which allowed the car maker to grow by leaps and bounds in recent decades as others, such as General Motors, languished. Whether it can get back on track remains to be seen. In the wake of the recalls and subsequent congressional scrutiny, the company has launched a worldwide quality-improvement project, though results from that effort may not be immediately measurable. In the interim, Toyota will have to rely on incentives and its bevy of devoted consumers, many of whom aren't quite ready to abandon Toyota's listing ship.